Opportunity NOW Intern Nadia Smalley interviews Captain Dhana Jones. Nashville, TN-Youth Safety is a way to establish a ground where kids can feel safe at school, home, and in any community. Safety is one of the most important aspects that come to mind regulating the actions and behavior of the youth. The role of the Youth Services Division is to investigate reported offenses where the victim is a juvenile, enforcing of laws regarding juveniles, and to resolute juvenile citations issued by police officers. This is done by counseling or referring the offenders to the appropriate agency in an attempt to prevent future delinquent behavior. The Division also investigates crimes that occur in schools during school hours, before and after school, at bus stops, and at school functions. 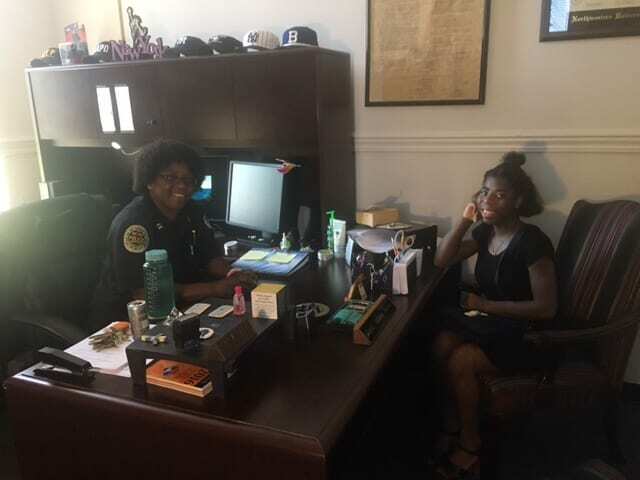 The Metropolitan Police Department connects with the youth by developing trust so that the youth can feel as if their voices matter. By doing such acts the youth understand that there is someone listening to their pain and the reason why they committed the crime that they did. Youth Safety is very crucial for the next generation, therefore current students need to step up and be the new leaders for the future generation. The Metro Nashville Police Department of Nashville and Davidson County has been providing programs as well as sitting down with convicted youth to lessen the number of young people sent into adult jail. This police department has seen some changes in families and children they’ve helped and, with decreasing numbers in Nashville of children and teens convicted. According to popular stereotypes, black males in particular are targeted to be seen or labeled as dangerous criminals. This stereotype has appeared frequently in American culture and has been associated with consequences in the justice system such as racial and profiling and harsher sentences for African American defendants in trials. The mass incarceration of African Americans in any criminal court case is seen as ‘The New Jim Crow’ phenomenon. Captain Jones explains, “Separating the races does not fix anything, it just causes more problems. Social, environmental, and behavioral factors play in the youth’s tendency to commit a crime”. The Metro Nashville Police Department has a number of sections and programs to regulate youth’s safety. For example, the Metro Nashville Police Department has a program called the Strengthening Families Program. The program was facilitated in the youth services section of the police department in January of 2011. This is a nationally and internationally recognized parenting and family strengthening program for high risk and regular families. It was developed in 1982 by Karl L. Kumpfer, Ph.D. In 2013, the Metro Nashville Police Department partnered with Family and Children’s Services and the Davidson County’s Sheriff Office. “One of our programs is the Strengthening Families Program, SFP, where we help families with troubled children find a way to become healthy again, whether that is through assisting them with school related problems, community problems, etc.” states Captain Jones. No one factor in isolation causes school violence, so stopping school violence involves using multiple prevention strategies that address the many individual, relationship, community, and societal factors that influence the likelihood of violence. Prevention efforts should ultimately reduce risk factors and promote protective factors at these multiple levels of influence. Many research papers and news reports tend to stereotype African-American teens and adults as more dangerous. Research shows that prevention efforts – by teachers, administrators, parents, community members, and even students – can reduce violence and improve the overall school environment. School violence happens in many middle and high schools, while some blame it on weak interest in education and apathy. To lessen school violence, many authorities believe we should teach our children that education may not be fun, but in the end, it will be one of the most important gifts given to them. The Youth Services within the Metropolitan Police Department of Nashville and Davidson County is very distinguished among youth safety. For more information, you can contact the Youth Services Division at (615)-862-7417. You can also find more info at http://www.nashville.gov.